The life of Francis of Paola speaks plainly to an overactive world. He was a contemplative man called to active ministry and must have felt keenly the tension between prayer and service. Yet in Francis's life it was a productive tension, for he clearly utilized the fruits of contemplation in his ministry, which came to involve the workings of nations. He responded so readily and so well to the call of the Church from a solid foundation in prayer and mortification. When he went out to the world, it was not he who worked but Christ working through him—"the least in the household of God." Francis of Paola was a man who deeply loved contemplative solitude and wished only to be the "least in the household of God." Yet, when the Church called him to active service in the world, he became a miracle-worker and influenced the course of nations. After accompanying his parents on a pilgrimage to Rome and Assisi, he began to live as a contemplative hermit in a remote cave near Paola, on Italy's southern seacoast. Before he was 20, he received the first followers who had come to imitate his way of life. Seventeen years later, when his disciples had grown in number, Francis established a Rule for his austere community and sought Church approval. This was the founding of the Hermits of St. Francis of Assisi, who were approved by the Holy See in 1474. In 1492, Francis changed the name of his community to "Minims" because he wanted them to be known as the least (minimi) in the household of God. Humility was to be the hallmark of the brothers as it had been in Francis's personal life. Besides the vows of poverty, chastity and obedience, Francis enjoined upon his followers the fourth obligation of a perpetual Lenten fast. He felt that heroic mortification was necessary as a means for spiritual growth. It was Francis's desire to be a contemplative hermit, yet he believed that God was calling him to the apostolic life. 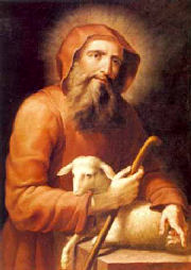 He began to use the gifts he had received, such as the gifts of miracles and prophecy, to minister to the people of God. A defender of the poor and oppressed, Francis incurred the wrath of King Ferdinand of Naples for the admonitions he directed toward the king and his sons.